Background: Nanotechnology has considerably modified the treatment of cancer by overcoming the prevailing drawbacks in conventional chemotherapy like severe systemic side effects, undesirable bio-distribution and drug resistance. Objective: The objective behind the present study was to develop polymeric nanoparticles loaded with gefitinib by ionic gelation method and optimize the prepared nanoparticles using Box-Behnken Design at 3-factors and 3-levels. The main and interactive effects of three selected process variables i.e chitosan concentration, sodium tripolyphosphate (NaTPP) concentration and NaTPP volume on the encapsulation efficiency and % cumulative drug release were determined. Method: Seventeen nanoparticle formulations were prepared by ionic gelation method using chitosan concentration (0.1-0.3% w/v), NaTPP concentration (0.2-0.6% w/v) and NaTPP volume (8-12 ml) applying Box-behnken design. The cryoprotectant used was 5% w/v trehalose. The nanoparticle formulations were further evaluated for various parameters. 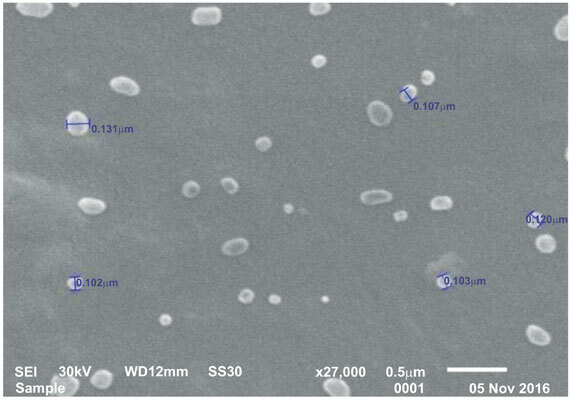 Results: The formulation (NP-5) prepared using chitosan (0.1% w/v) and NaTPP (0.4% w/v ) in 8 ml volume exhibited particle size (79.4 nm), polydispersity index (0.349), encapsulation efficiency (82.05 %) and % cumulative drug released (40.83 %) in phosphate buffer (pH 6.8) over a period of 24 h. The release mechanism followed was higuchi model. The values of various evaluation parameters observed were found to be in close concurrence with the values predicted employing the Design expert software. Conclusion: The nanoparticle formulation obtained using chitosan in low concentration, optimum concentration ratio of chitosan: NaTPP along with low volume of NaTPP showed desired features. The mathematical models were further designed to develop polymeric nanoparticles with required characteristics. Box-behnken design, gefitinib, nanoparticles, sodium tripolyphosphate, chitosan, trehalose, ionic gelation method.